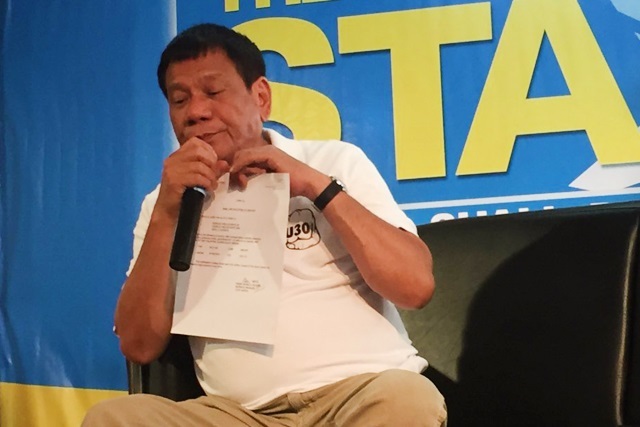 Davao City Mayor Rodrigo Duterte has revealed to the public his peso and dollar accounts with the Bank of the Philippine Islands a week after he was questioned over his alleged hidden wealth. In a press conference on Wednesday, the tough-talking mayor presented 11 passbooks and other bank certifications showing his transaction history for the past two years, Philstar reported. One of the certifications dated May 3, 2016 was issued by the BPI Julia Vargas branch and showed that his peso account has only contained P17,816.98 since March 31, 2014. 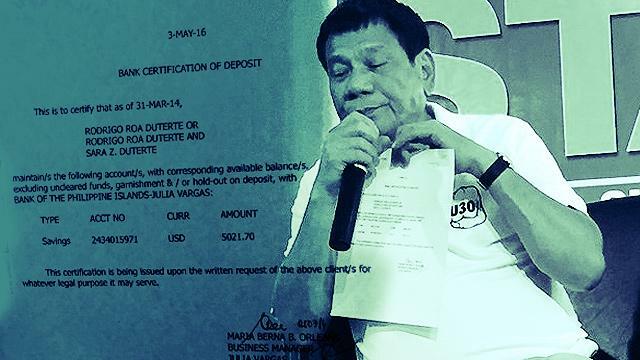 Duterte also bared the certification of his dollar account, which contained $5,021.70 (roughly P237,000), as a reply to rival candidate Mar Roxas II's dare. “Ipapakain ko ito kay Mar,” he said. Last week, Roxas challenged Duterte to “tell the truth” after he presented a bank deposit slip amounting to $10 which he said proved the mayor’s dollar account exists. It should be recalled that it was Senator Antonio Trillanes IV who sparked the hidden wealth controversy against Duterte, claiming that the mayor had undeclared the P211 million stashed in his bank account. Trillanes further claimed that Duterte had transactions worth up to P2.4 billion and challenged the mayor to reveal his banking details by signing a waiver. Trillanes and Duterte’s lawyer met on Monday to put an end to the issue but no waiver was signed which led to the fuming senator to label the mayor a coward.